By David Dennis | Originally posted by the Sierra Club. Tucked into the lush mountains straddling the border of Georgia and South Carolina, the gnarly Chattooga River is perhaps most well-known as the setting for the 1970’s movie Deliverance. In the film, a canoe trip goes awry as encounters with both lunatic locals and the raging river turn increasingly deadly and dark. So when the Sierra Club's Military Outdoors decided to spend a three-day weekend kayaking and rafting the Chattooga this past May (2017), a rational person might wonder what exactly he/she was signing up for. After all, how much of the Chattooga’s popular reputation is fiction? The first night of the trip, a group of would-be paddlers rolled into camp to meet one another for the first time. All branches of military service were represented, and all types: retirees, reservists, recently separated veterans, and family members. As is common with veterans, military service was the only icebreaker needed, and everyone soon gathered around a crackling campfire and chatted well into the night. The next morning, we drove to the Nantahala Outdoor Center’s Chattooga Outpost to meet our guides for the weekend. “NOC” wears its Deliverance connection on its sleeve, with references to the movie scattered throughout the outpost and inserted into many of the guides’ corny river jokes. One of NOC’s founders, Payson Kennedy, worked as a stunt double for the film. When the film spurred a sharp increase in boating on the Chattooga, Kennedy - amongst others - lobbied public officials for better management and protection of the river. Our first day was dedicated to learning the basics of whitewater kayaking along the upper stretches of the Chattooga. Our instructors got us geared up, introduced us to the fundamentals, and then got us on the water, where the river worked its magic on us. 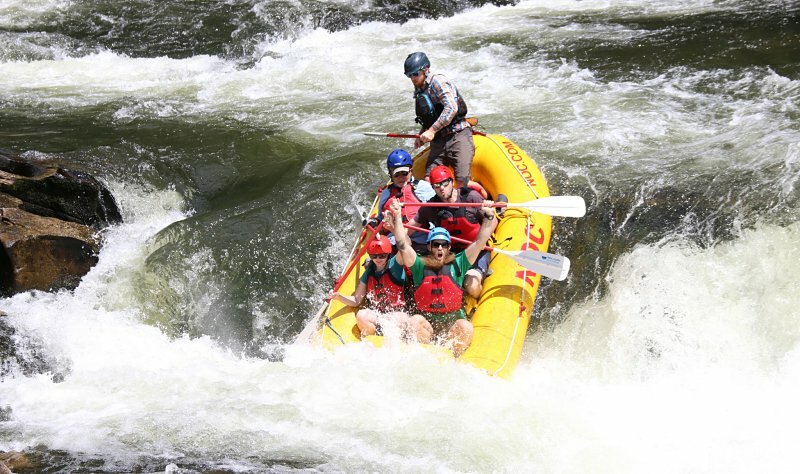 One of the most alluring things about the Chattooga is its free-flowing, undammed waters. After the passage of the Wild and Scenic Rivers Act in 1968, a committed group of local boatmen and conservationists pushed to get the Chattooga River on the list of protected rivers. Even the Governor of Georgia, a plain-spoken man named Jimmy Carter, lent his support. In return for their efforts, in 1974 the Chattooga became the first river east of the Mississippi designated Wild and Scenic (see The Wild President documentary by American Rivers and NRS). Floating on the Chattooga, it was obvious why the river was so special to those local boatmen and conservationists—and still is. There are few roads and no buildings within a quarter-mile of the river. As we kayaked, Carolina chickadees chattered in the forest understory and mountain laurel’s full white blossoms dotted the riverbanks. A light, sun-filtered rain joined us midway through the day. On Saturday, we exchanged our whitewater kayaks for rafts and the NOC guides took us downstream to rowdier sections. First we paddled “Section 3”, a 13-mile stretch of continuous Class II and III whitewater that finishes with a classic Class IV rapid named “Bull Sluice.” Here the Chattooga crashes into a plateau of rocks that pinch the river tight and dumps it sideways down a narrow stair-stepped cascade hemmed in on all sides by rock. Hence, the sluice. Despite its foreboding appearance, we made it through in one piece and returned to camp in high spirits. Sunday was our grand finale. Sometime during the night it started raining and never let up. We woke to gray skies, a chill in the air, and alerts of a flash flood watch on its way. Maybe that Deliverance hype wasn’t all fiction after all? At the NOC, our guides were more than amped. Based on the height of the river and the rate it was rising, they felt we could safely raft the final section—but only if we made good time. If we didn’t, we’d be forced to portage the big rapids as the rising water made them unsafe for commercial rafting. We decided to go for it. Bad weather makes for stunning rafting. We paddled out into a swollen Chattooga that disappeared downstream into patchy clouds and fog. Our guides pointed out “new” waterfalls and creeks that were crashing into the river and drowning out the relentless hiss of rain. Despite the ominous atmosphere, our group seemed to delight in the misery. We were wet and cold but it didn’t matter. The rapids were raucous, wild, and fun; the scenery was mesmerizing. By late morning we hit the top of the famous “Five Falls” - a tight section of five class IV+ rapids stacked on top of each other. Two rapids were already too big to run safely and we had to portage our rafts around them. Three falls remained. Our guides proceeded to thread thin, ephemeral lines down the rapids with deft paddle commands and plenty of wild guide-sticking. Before we knew it, the last big rapid was behind us and we reached the confluence with the Tallulah River, where the waters are caught up in Tugaloo Reservoir (created by the Tugaloo Dam in 1923). There was a tangible sense of accomplishment and awe amongst our crew. It’s safe to say we had all fallen in love with the Chattooga and its many moods. Rivers of all types are beautiful. But the wild ones, the unruly stretches of beauty that flow and surge and cascade to their own indecipherable rhythms are something special. I felt it on the Chattooga, and I’ve felt it on other wild rivers I’ve had the privilege of spending time with. They say people only really fight to protect what they know and love. If that's true, then I'm grateful for the Sierra Club’s Military Outdoors program for creating the opportunity to add the Chattooga to my list. ...And if you do hear banjos, paddle faster! David Dennis is an Air Force veteran who works, lives, and plays in the mountains of the Sierra Nevada. He is a volunteer with the Sierra Club Military Outdoors.